Encourage deep thinking about both instructional and independently read books by utilizing these probing, title-specific resources. Text-dependent questions guide students to build evidence-based responses. Search for a specific book. Vocabulary lists, with example sentences providing authentic context from the books themselves, build student mastery of assigned book's key words. Browse 956 vocabulary lists for specific books. Build your own on Vocabulary.com. Prompt thoughtful book discussions about eight qualitative elements of text by completing interactive rubrics. 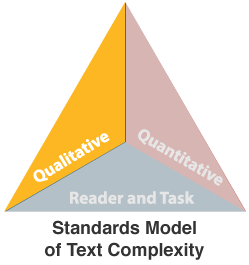 Analyze a book for qualitative measures of text complexity. You will receive a certificate acknowledging your text complexity review via email. Use these instructional resources to bring challenging vocabulary and high-order questioning to your next unit.